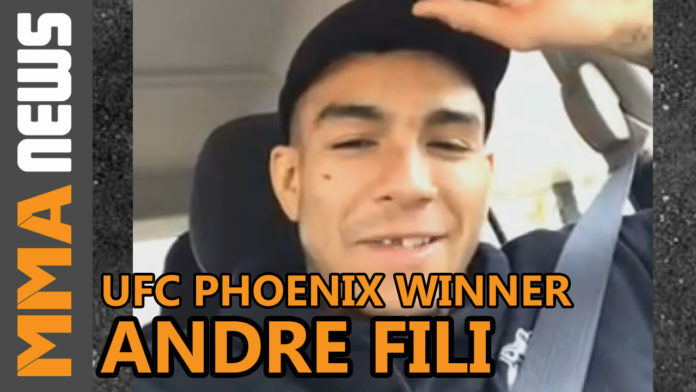 Andre Fili didn’t have any doubt about his hand getting raised this time. Coming off back-to-back split decisions – a win against Dennis Bermudez and a loss against Michael Johnson – Fili put on one of the best performances of his career in a unanimous decision victory over Myles Jury at UFC on ESPN 1. One of the benefits the Team Alpha Male product had heading into the matchup was two of his teammates, Rick Glenn and Chad Mendes had already fought Jury. It was just another factor capping off what he describes as one of the best camps of his career. Fili (19-6) has now won three of his last four fights and is entering in the prime of his career at 28-years of age. With that said, Fili is aware how deep the division is and looks to keep the momentum going. The California native likes to do his talking in the cage and isn’t one to call out his next opponent. When asked about who he’ll square off with next, Fili responded with former WWE star Stone Cold Steve Austin. A pro-wrestling fan growing up, Fili says he’d leave the door open to a potential crossover once his MMA career is over. “The media just pressured me about the next fight, like they wanted me to call someone out so bad.” Fili explained. “That’s cool but sometimes it’s corny to me the way people go about it. I just didn’t want to any corny s**t. So I called out Stone Cold in “Hell In A Cell”, “Losers Leave Town” match. Pro-Wrestling is just like fighting, they tell the best stories. I got to make it important. When Stone Cold and I square off in the square circle it will actually mean something. Man I love pro-wrestling, I’m not super into it now I just don’t watch it as much. Pro-wrestling is the reason I’m a fighter today. I’m not sure I have the legs for 9 pro-wrestling’] I’d have to get some leg gains. I’d love to get some pro-wrestling fights in once I win this title.